M35 is the finest star cluster in the constellation of Gemini, 2800 light-years away, which is approaching us at a speed of 5 kilometres a second. Catalogued by Charles Messier in 1764, it was discovered in 1745 by the Swiss astronomer Loys de Chéseaux. It is a young cluster of which the age is estimated to be 150 million years, which explains why most of the 2500 stars in it are blue, like those in the Pleiades cluster. Of an apparent size equivalent to the full Moon, M35 has a magnitude of 5.3, so it can be seen with the naked eye in a very dark sky. Using a telescope its neighbour M35, the NGC 2158 star cluster can be seen. 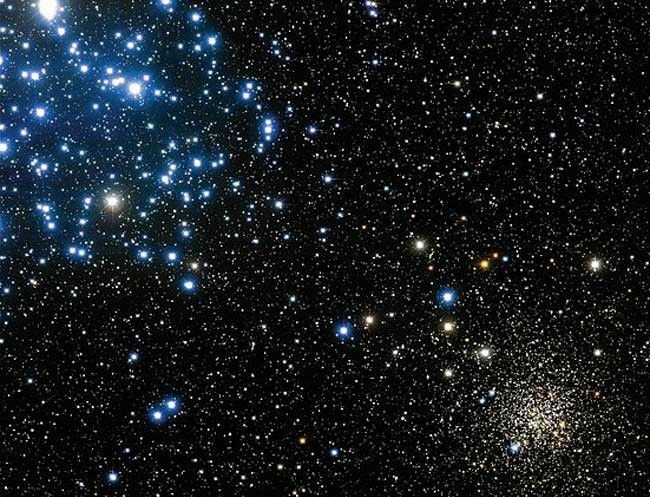 This cluster, which is 4 times further away and 10 times older, is composed of yellow stars. Astronomers thus have two stages in the life of star clusters in the same field of view of their instrument.